It has been a challenging week for families living with the reality of autism and for those educating Americans about the need to institute vaccine safety and informed consent protections in public health programs. It was a week when individual extremists from the political right and the left revealed their capacity for ignorance and prejudice, even as many enlightened Americans demonstrated their capacity for understanding, concern and compassion. It was a week that ended with a revelation that the American Academy of Pediatrics, Every Child by Two and the pediatrician leading a national effort to eliminate exemptions to vaccination, Paul Offit, M.D., are all taking big money from big Pharma. Several months ago when Unlocking Autism (UA) President Shelley Reynolds called me and asked if NVIC would join UA in mounting a major exhibit at the Netroots Nation progressive blogger conference in Austin, TX July 17-19, I knew it would be an opportunity to reach out to several thousand Americans blogging on important social and political issues. We worked hard to create a professional exhibit (the largest in the Exhibit Hall) that would include representatives from SAFEMINDS, TACA, and Age of Autism contributing information and helping to staff the booth. The theme of our exhibit was "Vaccine Safety: What's Choice Got To Do With It?" and the buttons and t-shirts we wore said "Vaccines: Our Children. Our Choice. Our Vote" while the facts listed on the 16 foot high tower exhibit included "Vaccine Market: $21 Billion" and "Toxic Vaccine Ingredients" and "One-Size-Fits-All Vaccine Policies" and "No Vaccine Risk Research" and "Autism: 1 in 150 children; 1 in 94 boys; $3.2M per child" and "Giving Mercury to Children on Purpose Is Stupid." We were ready to answer questions from the more than 2,000 bloggers showing up to listen to Howard Dean, Nancy Pelosi, Al Gore and other speakers talk about issues important to Democrats as well as the nation. While we were finishing setting up our exhibit on the morning of July 17, Shelley and I, along with Rebecca Estepp (TACA), Theresa Wrangham (SAFEMINDS), Kevin Barry, Paul Arthur (NVIC) and my son, Chris, started networking with other exhibitors. (Later we would be joined by Mark Blaxill from Age of Autism and attorney Jim Moody). The booth directly across from us was Media Matters. 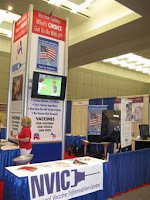 As the bloggers came into the Exhibit Hall and walked by our booth, we handed out vaccine information. Suddenly, a middle-aged woman with a scowl on her face appeared and screamed "baby killer" at Becky but refused to engage in a conversation. Later we were told that several complaints had been lodged with the convention organizers (to which the organizers responded that Netroots Nation welcomed open dialogue on such an important health issue). A few hours later we learned about the obscene tirade that conservative shock jock Michael Savage had let loose on children with autism and asthma. We had a conversation with our new blogger friends at the Media Matters booth, who were quite familiar with his rants. By the end of the day, Media Matters, had set their blogger sights on Savage. Their quick action played a major role in galvanizing both the autism community and enlightened Americans from both sides of the political spectrum disgusted by the cruelty of mindless prejudice against children and families suffering with autism and asthma through no fault of their own. Big advertisers like Aflac, Radio Shack and Sears pulled their ads from Savage's nationally syndicated radio show. Radio stations in Virginia, Ohio, Mississippi and elsewhere canceled the show. On the last day of the convention, we put our brochures on the luncheon tables. During the final hour, the scowling woman reappeared to hurl one last hateful insult at us. This time she targeted my son, who has come so far in the 28 years since the neurological reaction to his fourth DPT shot that left him with multiple learning disabilities and ADD. She called Chris a "traitor" and shouted "where are your double blind studies?" and then, as he tried to bring me over to speak with her, she ran away shouting "I didn't think so!" before a conversation could take place. The events of the past week reinforce the fact that ignorance and hate does not belong to any one political party or ideology. The extremists on the right and the left meet at a dangerous intersection which threatens freedom and diminishes the value of individual life. And when doctors and organizations denying vaccine risks persuade naive public figures to demonize others for making independent vaccine choices, it contributes to an ugly climate of fear and divisiveness. When it turns out those same doctors and organizations get big money from drug companies selling vaccines, the public has no reason to trust what they say or tell us to do. Vaccination is a subject that elicits emotional responses from both those promoting forced use of multiple vaccines and those defending the human right to informed consent to vaccination. It involves a personal examination of what we know, fear, believe and value because what we choose to do can profoundly affect the health and lives of those we love the most. Many of the conversations taking place in private and public forums about vaccination are civil and, hopefully, most Americans will turn away from those letting fear, prejudice or greed define who they are. In any case, we should never let someone else define who we are or dictate what we can or cannot do when it comes to protecting the health of our children. As the battle lines are being drawn between those who want to force all children to use 69 doses of 16 vaccines and those who are defending the right of parents to exercise voluntary, informed consent to vaccination, it is coming down to a matter of whose message do you trust. Should government health officials, pediatricians and vaccine manufacturers, who have been denying vaccine risks for three decades, be trusted to be defacto lawmakers and force vaccination on everyone or should Americans be allowed to become informed about vaccination and legally make voluntary vaccine choices? As more parents report that their young girls are suffering disabling reactions to GARDASIL (see a video clip of the WUSA-TV coverage), doctors determined to coverup HPV vaccine risks are giving out inaccurate information (see video clip of a FOX News story ) while public health officials defending vaccine safety write books and parents want more information and choices. All Americans deserve the right to be fully informed about the risks associated with any pharmaceutical products or medical procedure and be allowed to make a voluntary decision about taking that risk with their own life or the life of their child. The right to informed consent to medical risk taking is a human right. Gardasil Controversy: Are the HPV Vaccine's Side Effects a Legitimate Concern? While Merck has pulled in $1.5B from sales of GARDASIL vaccine worldwide, there are continuing reports that girls are being crippled and dying after getting the HPV vaccine fast tracked and licensed by the FDA in 2006. Although the roll-out of GARDASIL with an unparalleled multi-million dollar mass media advertising blitz has created a profitable market for the drug company that took huge losses from Vioxx injury/death lawsuits, the persistent reports of Guillain Barre Syndrome (GBS) paralysis, arthritis, seizures and sudden loss of consciousness within 24 hours of vaccination continue to haunt the marketing campaign. Last week Judicial Watch issued a report on more than 8,000 GARDASIL reaction reports to the federal Vaccine Adverse Event Reporting System (VAERS) obtained under the Freedom of Information Act (FOIA). A search of the VAERS database , which includes reaction reports through April 30, 2008 released to the public by the FDA, reveals nearly 6,700 reports of injury and death after GARDASIL. Two GARDASIL vaccine injury claims recently were filed in the federal Vaccine Injury Compensation Program under the National Childhood Vaccine Injury Act of 1986. Exactly two years ago, NVIC sounded the first public warning about GARDASIL risks pointing out that Merck had not adequately proven the vaccine was safe and effective to give to girls under age 16. NVIC pointed out that pre- licensure trials were flawed because they used an aluminum containing placebo that may have masked the true reactivity of GARDASIL, which also contains 225 mcg of aluminum. Like mercury, aluminum can cause inflammation in the body and kill brain cells. The fact that Merck had only studied the vaccine in fewer than 1200 girls under age 16 and followed them up for less than two years before licensure did not seem to bother doctors working for the CDC's Advisory Committee on Immunization Practices (ACIP), who saluted Merck smartly and promptly recommended that all 11 year old girls entering sixth grade get three doses. By the end of 2006, Merck had marshaled its well- paid lobbying forces bolstered by a flashy television advertising campaign in an unprecedented effort to persuade legislators in every state to turn CDC recommendations into law and pass HPV vaccine mandates. Texas Governor Rick Perry went so far as to issue an Executive Order mandating the vaccine for all sixth grade girls. GARDASIL had only been on the market for a few months and nobody, including Merck, knew the full range of side effects when GARDASIL was given to millions of girls entering puberty. Nevertheless, the pressure was on young girls, their parents and state legislators to trust blindly that the vaccine had no real risks. In early 2007, NVIC again warned the public that there were significant risks associated with GARDASIL , especially when it was combined with other vaccines. NVIC warned that there was evidence that giving GARDASIL during active HPV infection may increase the risk for cervical cancer while girls were not being tested for active HPV infection before getting vaccinated. NVIC also advised that girls should not drive home after getting the shot because of the risk for sudden loss of consciousness after leaving the doctor's office. In March 2007, the CDC admitted that there was no scientific evidence that GARDASIL can be safely co- administered with other vaccines (like TDaP, meningococcal, varicella, MMR, influenza). Even so, without a second thought, the CDC urged doctors to assume safety and go ahead and give GARDASIL simultaneously with other vaccines. By end of May 2007 almost every state had rejected proposed mandates for GARDASIL vaccine and there were more than 2,000 GARDASIL adverse events reported to VAERS. In August 2007, NVIC released a comprehensive analysis of GARDASIL reaction reports to VAERS and a critique of the CDC's universal use recommendation. In a letter, NVIC asked the CDC to warn doctors that the simultaneous administration of Menactra with GARDASIL increases the risk for GBS and other serious adverse event reports. The CDC chose to blow off NVIC's report and do nothing. Two years after licensure, it is clear that GARDASIL has plenty of risks for young girls. Among the more than 130 GARDASIL reaction reports that have been filed with NVIC's 26-year old Vaccine Reaction Registry is one that was posted by a mother, who witnessed what happened to her daughter on the International Memorial for Vaccine Victims. Amanda's mother describes her daughter as "a beautiful, active girl that was brought down." Only 14 when she was vaccinated, Amanda "became weak, tired and sick to her stomach" but the symptoms subsided. One week after the second HPV vaccination, her legs "became very weak and she started losing feeling in her feet." She was hospitalized in the Intensive Care Unit for four days with a diagnosis of Guillain-Barre Syndrome. Amanda's mother said "The doctors thought we were CRAZY when we mentioned that the HPV vaccine could cause this." "Amanda is constantly sick," says her Mom. "Something has suppressed her immune system so badly she can barely function. The depression got really bad because she is experiencing a lot of pain in her knees now and can't do any sports. She was once very active and right now can barely go to school We were told me her doctors that there is nothing more that they can do and that she could use a good psychiatrist." How many more girls like Amanda and her mother have had their futures stolen by a vaccine that is supposed to prevent a viral infection that is cleared without any residual effects by more than 90 percent of all who get it to prevent a cancer that causes less than 1 percent of all new cancer cases and cancer deaths in the U.S. every year? Did Amanda and her mother know that cervical cancer can be prevented nearly 100 percent of the time with annual pap smears and early intervention when pre-cancerous cervical lesions are diagnosed? Or did Amanda's Mom believe Amanda would be "one less" because a pediatrician told her so? NVIC continues to receive reports from grieving mothers and fathers who can't find doctors to treat their once-healthy daughters who are now chronically ill and disabled after being injected with GARDASIL. In almost every case, the doctors are denying the vaccine had anything to do with what happened. The tragic denial by the medical profession of the harm vaccines can do continues decade after decade after decade. When will doctors stop being marketers of pharmaceutical products and implementers of government policy and embrace the moral imperative to "first, do no harm?" The "its all a coincidence" defense mounted by doctors when something bad happens after vaccination is illogical, unscientific and dangerous. When will Americans get up off their knees and stop worshipping men and women in white coats who do not know what they are doing?